WhatIfSports.com's MLB simulation engine played the Giants vs. Cubs series 101 times to predict which team will advance to the NLCS. Two teams with very different postseason histories will go head-to-head in the National League Division Series when the San Francisco Giants take on the Chicago Cubs. The heavily favored Cubs came out on top in 75.2 percent of our simulations, most frequently winning the series in a deciding Game 5 (30.7 percent). In 23.8 percent of the simulations, the Cubs pulled off the clean sweep. Interestingly enough, the Giants managed a sweep in only one of the 101 simulations. 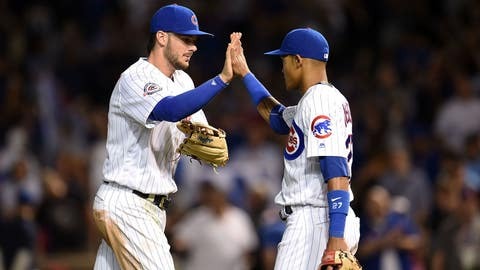 The Cubs narrowly won the regular season series between the two teams, 4-3. Leading the way for the Cubs in our projections was the 1-2 punch of Jake Arrieta (3.26 ERA) and Jon Lester (3.24). Chicago’s pitching staff as a whole, including the bullpen, was brilliant in our simulations, maintaining a 3.42 staff ERA. The Giants, meanwhile, didn’t fare so well with a team ERA of 4.61 thanks to some bad efforts from the bullpen. Madison Bumgarner (4.02 ERA) wasn’t quite as magical as he’s been in the postseason in the past, either. Doing most of that damage for the Cubs lineup was Kris Bryant, who averaged .81 home runs per game and hit .318 over the course of our 101 simulations. Wilson Contreras (.288) and Dexter Fowler (.283) pitched in as well. Ultimately, it was San Francisco’s bats that were the main culprit for the series loss, as the Giants hit .236 as a team. Buster Posey was the only player to bat over .260 for the entire team.